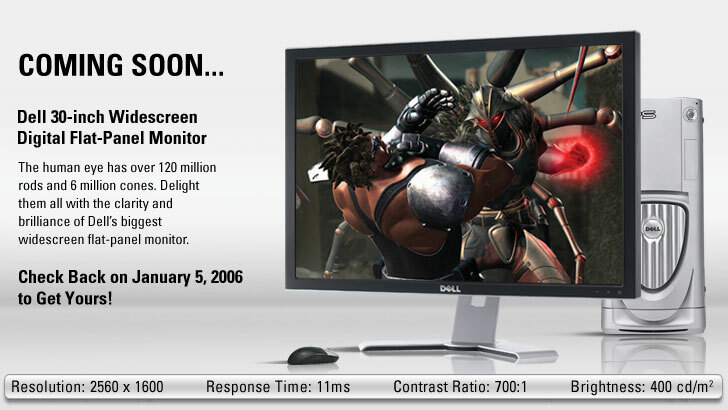 Just when I thought I was done… Dell is introducing a 30” widescreen flat panel. This is the kind of forced upgrade that just drives a computer geek like me nuts. Or it would if I cared. 6” more doesn’t do a whole lot for me at this point since I already own a 2405FPW… but if I was still on a 17” or 19”, this would be the one I’d want. Money isn’t that important, is it? Everything AOL touches turns to crap. I think that the idea behind AOL is simple: make things easy to use and available to everybody. That’s not a bad thought in general, but AOL manages to do it in a way that ticks me off… every time. So now that Google and AOL are moving past first base, some of the ugly details are starting to come out. For example, this post on Slashdot that suggests that they will be adding logos and graphics to a lot of the advertising that is shown on the Google sites. This concerns me greatly. I don’t care for advertising any more than anybody else, but I recognize it’s value and understand that in today’s society it is essential to sell products. However, Google has always done it so much better with the text ads. They’re non-obtrusive, easy to deal with, and sometimes very useful. I can pay attention to them or not, and I feel like I get a choice. Now, I don’t want to start knocking on this change until I see it go live, but I will say that I’m worried about the direction this is going. Yes, Google is a public company now, and they need to increase shareholder revenue… but, try and do so without ticking off your core user base… please? So I’m still somewhat dealing with the fact that my last relationship is over. I really wish for the kid’s sake that it wasn’t, but she decided by her actions and words that we’re far in past. I was in court on Thursday to answer to the child support question, and for once, the system worked as it should. I’ve had the kids upwards of 75% of the time, but I was still being asked to make a payment as if I wasn’t in their life at all. We mutally decided that we could take care of things outside of the court and would only involve them if required. I was speaking a good friend today and she said that her ex told her that the reason he wasn’t spending much time with his kids was because he was paying so much support. That’s not cool… child support doesn’t replace the relationship you should have with your kids. I know that I’m more than a paycheck, and my kids know that I’m the best father I can possibly be to them. My friend Howard asked me on Friday how the “first day of the rest of my life” was going… he hit the nail on the head there.